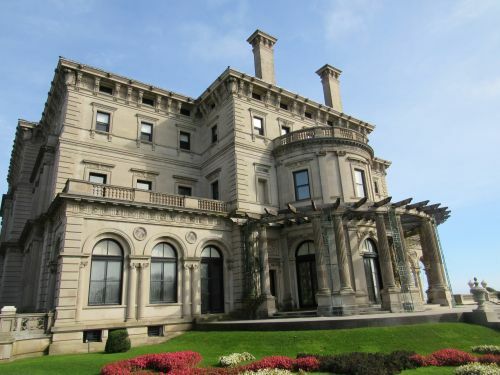 The Breakers in Newport, Rhode Island was the “summer cottage” of Cornelius Vanderbilt II. Fire destroyed the original cottage, and Cornelius ordered the existing mansion built on the same site in 1893. It took several years, and Cornelius didn’t spend much time in his new mansion before he died in 1899. 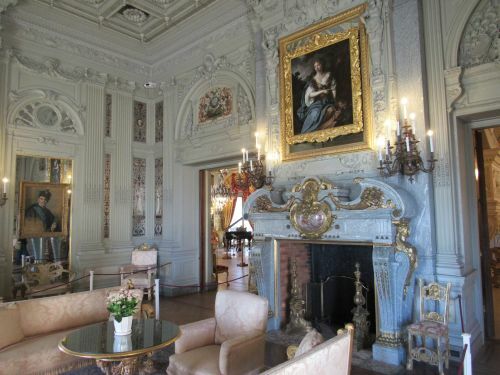 The mansion overlooks the Atlantic Ocean and it takes it name from the waves pounding the cliff below—The Breakers. In a word—it’s impressive. 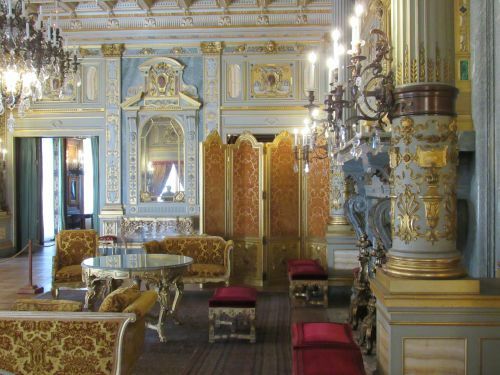 It’s full of marble, beautiful wallpapers and furnishings. 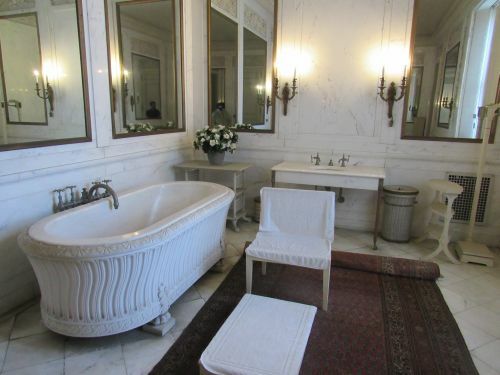 The marble bath tubs are something to be seen (evidently, the servants had to fill the tub to warm the marble, then refill it for their master’s use). 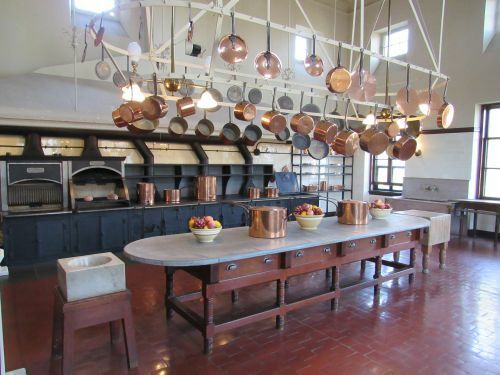 The butler’s pantry and the kitchens were the best I’ve ever seen. My photos don’t do them justice. My husband wasn’t keen when I dragged him off for his daily dose of culture, but he enjoyed The Breakers and later thanked me. 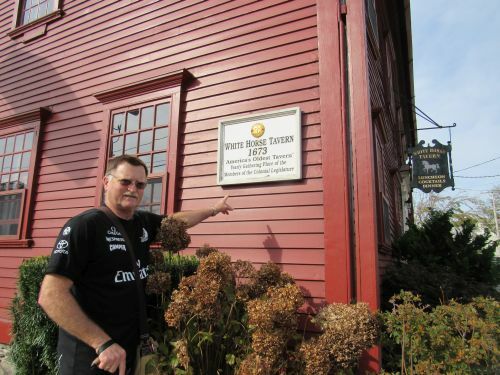 Of course, it didn’t hurt that we visited the White Horse Inn for drinks and a snack—reputably America’s oldest inn since it opened in 1673. I highly recommend a visit to The Breakers and the White Horse Inn, should you ever find yourself in Newport. 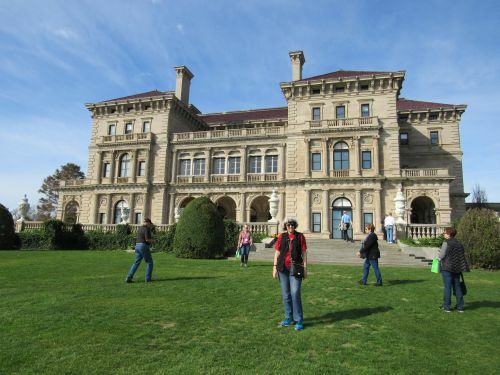 This is me at the front of The Breakers. 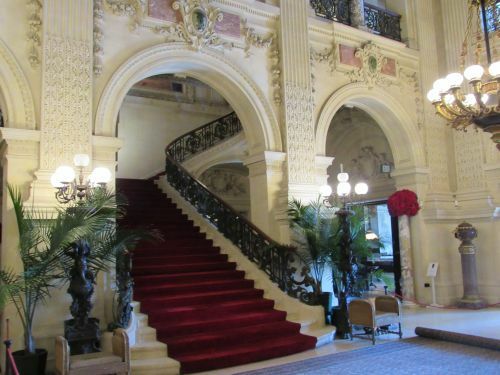 This photo is taken in the ballroom, looking toward the grand staircase. It’s said that it was a tradition for the Vanderbilts and their guests to slide down the bannisters on trays. 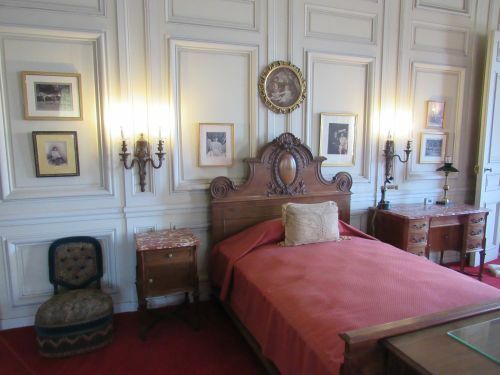 One of the many decadently decorated rooms. The amazing marble bath that required filling twice so that the marble heated and didn’t freeze a backside! The kitchen was amazing and full of all sorts of mod-cons for the time. A view of The Breakers from the side. Hubby at the White Horse Inn. Our last bit of “culture” for the day and a welcome break with local beer and a bowl of clam chowder. 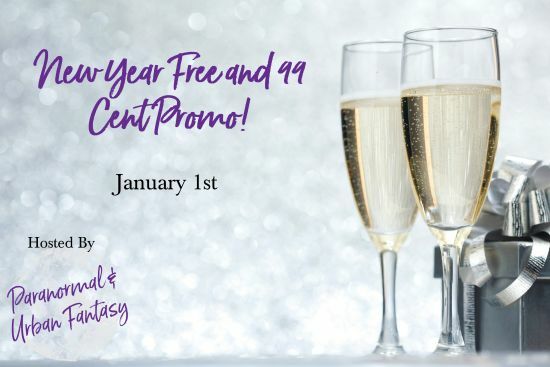 January FREEBIE Frenzy & Giveaway Event January 1-5! Over a dozen authors are sharing the ultimate collection of paranormal, urban fantasy and sci-fi reads! Stop by and pick up a new favorite book! Check out the paranormal romance sale. 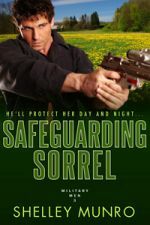 Win an e-book from my back list. Check out the Facebook Hop to have a chance of winning one of my e-books or one of the many other prizes on offer. My Feline Protector is free today. One day only so don’t delay! 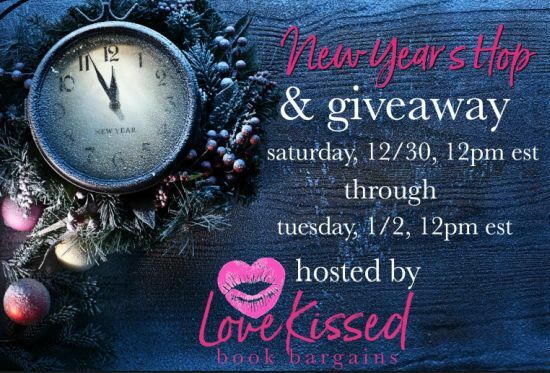 Enter to win a collection of over 80 romance ebooks and a Kindle! Scotland immediately comes to mind when I think of shortbread, and my next thought is always Christmas. 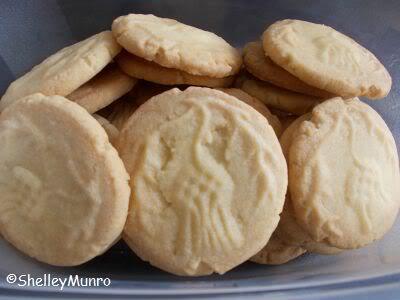 It’s said that shortbread developed from a medieval recipe, with the modernized recipe attributed to Mary, Queen of Scots. Over time the ingredients changed, with butter replacing the yeast. Butter was an expensive ingredient, which meant shortbread was only baked on special occasions. Butter has become very expensive down here in New Zealand, so nothing has changed in that respect! I tend to bake shortbread at Christmas. It’s one of my favorite biscuits to eat, a trait I fear I inherited from my father because it’s his firm favorite too. The recipe I use comes from Jo Seagar’s Easy-Peasy Summer Entertaining recipe book. Beat the butter and icing sugar until creamy. Mix in the cornflour and flour. Roll into teaspoon size balls with your hands. Place on a tray lined with baking paper. Flatten and press with damp shortbread mold. Bake at 150C for 25-30 minutes until the shortbread is pale but crisp. Cool on a wire rack and store in an airtight container. 1. The original recipe says to roll out the dough and cut out star shapes. I’ve always found the dough too soft to do this–maybe because I tend to make this recipe during the heat of a New Zealand summer–and after experimenting I’ve found teaspoon size balls work best for me. 2. If I feel in the mood for a variation with bite I add 1 tablespoon of cocoa and 1 teaspoon of chili powder just before I add the flour and cornflour. Sometimes I’ll also add chocolate chips-the small kind. 3. If you don’t have a shortbread mold, press down with a fork. Dip the fork in a cup of cold water after flattening each biscuit to avoid sticking. 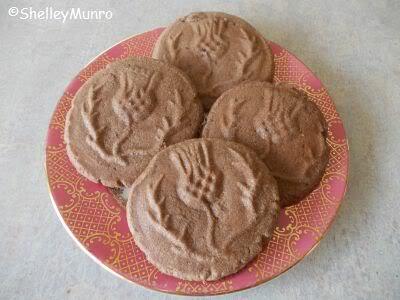 Here’s a photo of the Chili Chocolate Shortbread. Are you a shortbread fan? 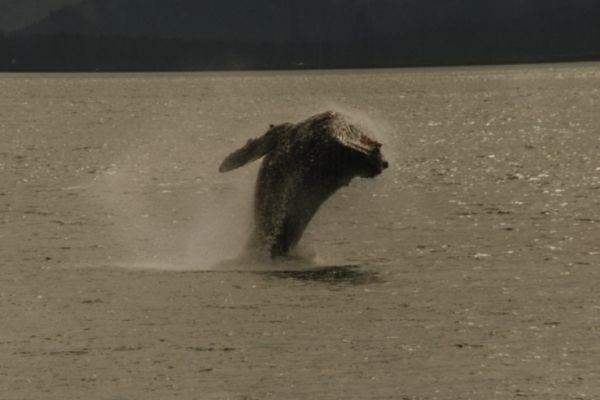 This photo of a breaching humpback whale was taken in Alaska a few years ago. The humpback whales are amazing creatures and can be very curious, coming right up to the boat and doing lots of spyhopping to see what the strange humans are doing. I’ve been lucky enough to see them in the Southern hemisphere as well, and highly recommend the experience should you ever get a chance to go whale watching. We saw this dog while we were walking in Vava’u, Tonga. He craned his neck to see us and seemed to be guarding this partially built house. 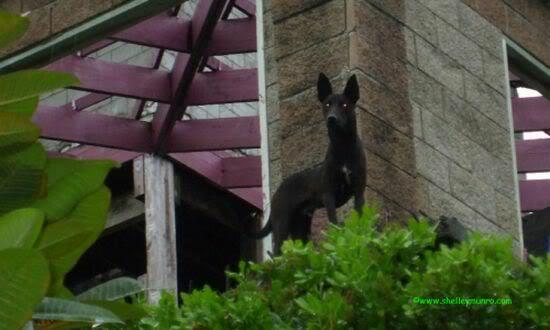 He looked a bit like a devil dog with his glowing eyes. Check out the 99c book fair. 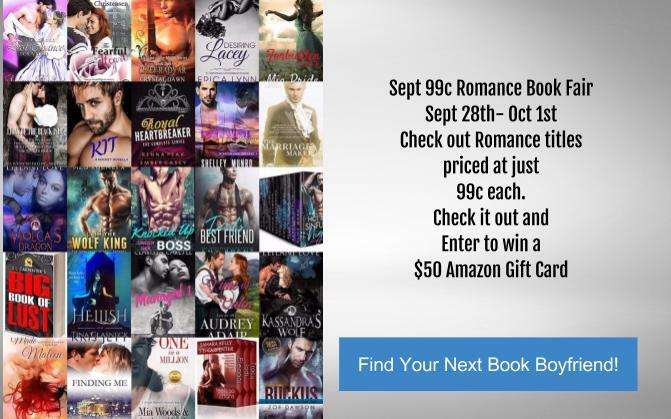 A genre for everyone plus a chance to win a $50 gift card.